No Bits Please. I’m British. The other week I went to Oberlaa, on the outskirts of Vienna and discovered the best thing about Austria. It is brimming with thermal lakes which have been turned into day spas or hotels. In Oberlaa is Therme Wien, a large complex of thermal pools. It’s fabulous to sit outside in a steaming bath while it’s minus seven on a bleak winter’s day. 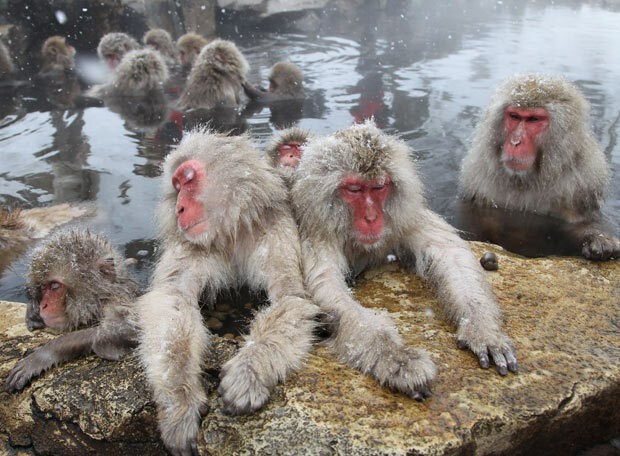 I felt like one of those Japanese monkeys that you see pictures of, the ones sitting in hot springs, having a great time while it snows on their heads. After an afternoon of relaxation I sleepily trundled off to get ready. I knew what trauma was awaiting me; lots of open showers with starkers people in it. It’s always the same. Austrians love stripping off and it makes me feel incredibly bashful; it takes all my confidence to wear a bikini when I’m not on a beach. I always find myself thinking ‘God put it away love,’ and I am set enough in my cultural ways to say that I couldn’t possibly go naked because it’s just not British. I rigidly stick to my habit of showering with my swim suit on and getting changed under a towel in the absence any free changing rooms, because the showers are just to rinse the chlorine off before you go home and get showered properly. Thankfully, these changing rooms were segregated, but I have been to a swimming pool where there were naked men in the communal shower, because for some reason they didn’t want to use the empty shower cubicles which had doors, opaque ones at that. Back in the Therme Wien I had a brief moment of panic when I thought that perhaps the naked showerers were going naked to ensure they removed all traces of chemicals from the sulphurous pools we’d been lounging in, but on consideration I concluded that they were naked because it’s what they do. Just to be on the safe side, I pulled at the top of my swim suit and had a quick rinse of my bits when no one was looking. And yes, most eyes were on me most of the time because I was the strange one effectively showering while still dressed. We’d bought the cheap ticket and not the all-inclusive ticket which entitled us to use the swanky looking ‘Sauna World’ so we went to investigate in case we wanted to go in next time. We saw at the entrance signs clearly stating that the saunas were naked and pictures of clothes and swim wear enclosed in big red circles with a big red line through them. The typical no smoking sign had become the ‘no clothes wearing’ sign. There was a choice of three saunas; Damen, Herren, Gemischt; women, men, mixed. While the thought of mixed nakedness with strangers makes me shudder, I have been told this is all very normal. A friend of mine told me about the time he had a naked sauna with his girlfriend and all her family, at the family house. He even sat next to her mother. I sniggered for ages when he told me and asked lots of immature questions about whether everyone looked at each other’s bits. Perhaps one day I’ll go native and go naked, but for the time being I’ll be showering in my cozzie.